Journal: American Journal of Insanity; vol. xxvii, July, 1870. Edited by medical officers of the New York State Lunatic Asylum. Utica : State Lunatic Asylum, 1870-71. Description : pp. 13-28, [1 l.] ; ill., 1 plate, 23 cm. Photograph : 1 composite albumen mounted on card stock. Photographer : unknown (probably J. B. Andrews). Subject : Ear Diseases — Haematoma Auris. Hun was Special Pathologist at the Utica Asylum. Photo size : 11 cm x 13.3 cm. General paresis — 8 cases. Chronic mania — 4 cases. Acute mania — 4 cases. One third of Hun's subjects suffered from general paresis, which was a parenthetical term for the various complications of neurosyphilis. It is quite reasonable to assume that an auricular syphilis developed in these patients, especially in four patients who were diseased in both ears. Two of the melancholia and two of the acute mania patients were also infected in both ears, and one each of the dementia, and chronic mania patients. Ten patients in total were infected in both ears, indicating a systemic disease that could be associated with their madness. Numerous other disorders are associated with unilateral or bilateral perichondritis including diabetes mellitus, strep or staphylococcus infections, relapsing polychondritis, and Wegener's Granulomatosis. However, Doctor Hun has to write several pages of rebuttal to the charge that "insane ear" is nothing more exotic than the result of two inmates getting into a brawl, and the fact that 23 of his cases are men, doesn't help his position. His position is supported, though, by the fact that one half of the cases died within a few months from the first sign of infection. The two lower figures represent the ears of the patient described in case No. 4. The left hand figure is a photograph taken from a plaster cast, which cast was made when the tumefaction was greatest. The right hand figure represents the same ear after rupture and contraction had taken place. 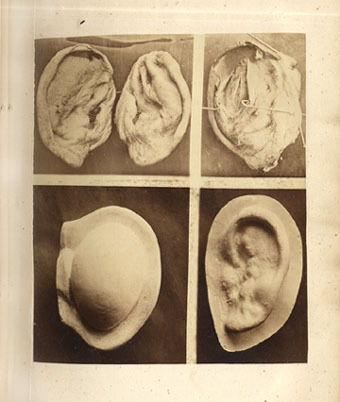 The three upper figures were taken from the ears of the patient described in case No. 9. The two left hand figures show the amount of contraction which took place after rupture of the cysts ; while the figure on the right shows a section of one of them, and demonstrates the separation of the perichondrium from the auricular cartilage.